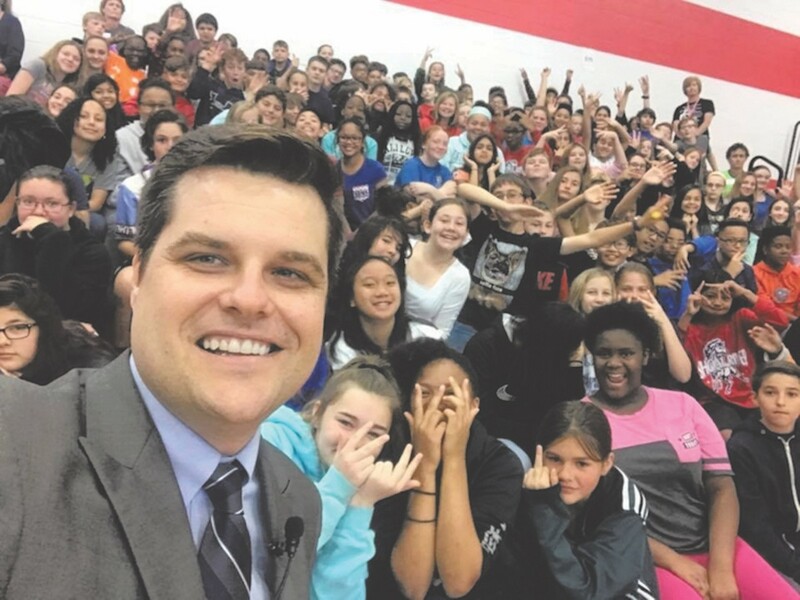 Eternal fratboy and freshman Congressman Matt Gaetz, R-Fort Walton Beach, took some time off from being Donald Trump's favorite sock puppet on May 1 to speak to students at Shoal River Middle School in the Panhandle. We're guessing the speech wasn't about the importance of International Workers' Day, but he did snap a candid selfie in front of an assembly of students and post it to his social media, only to discover that a girl in the front row was giving him the age-old middle-finger salute. To his credit, Gaetz was magnanimous in his response, saying, "Her congressman has also had an occasional lapse of judgment as a middle schooler." Apparently he forgot more recent lapses in judgment like referring to his own constituents as "professional liberal protestors," proposing legislation to abolish the EPA, or backing up Trump's denigration of "shithole countries" – or doesn't think they count as such. We disagree, and salute him with all due respect.